The beauty brand, Physicians Formula, and I go way back. Waaaayyy back. Like high school years back. I was first introduced to Physicians Formula by my lovely Mother, who bought me my first eyeliner pen when I was a senior in high school (yes, I started playing with makeup quite late, hah). Ever since I picked up their eyeliner for the very first time, I was speechless at just how much a simple eyeliner can transform your entire complexion. From that day on, I knew that eyeliner was one of my makeup essentials whenever I decided to do my makeup that day. You can read more about my past experience with Physicians Formula in an older blog post here. Fast forward to today, I fell in love with even MORE Physicians Formula products once I became acquainted with more of their products. From their glowy Highlighters (I own FIVE!) to their irresistable Butter Paradise Fragrance (which is why my best friend, Marisa, is obsessed with smelling me during our hangouts), I love how Physicians Formula offers a variety of quality makeup products that do not come close to breaking the bank. If you want me to name other products that are my current faves, be sure to check out Physicians Formula Killer Curves Mascara as well as their Butter Paradise Fragrance and Body Butter (which are offered only in their Butter Collection kit). These are products that I need to restock on as soon as I run out! Now that I’ve given you a proper introduction to Physicians Formula, I wanted to share more specifics on TWO amazing holiday kits that they are coming out with! The Essential Minis holiday kit comes with five essential products - the Rose All Day Oil-Free Serum, Spotlight Illuminating Primer, Mineral Glow Pearls, Healthy Lip Velvet Liquid Lipstick, and Killer Curves Mascara. Not only will your loved one be able to try multiple products from the Physicians Formula collection, but she can always purchase the full-sized product if she finds one that she is attached to! The Color Me Healthy holiday kit is a JACKPOT to those in your life who LOVE playing with makeup, specifically new lip colors! I had the honor and opportunity to promote Physicians Formula’s Liquid Lipstick collection last year in a previous Instagram collaboration here. 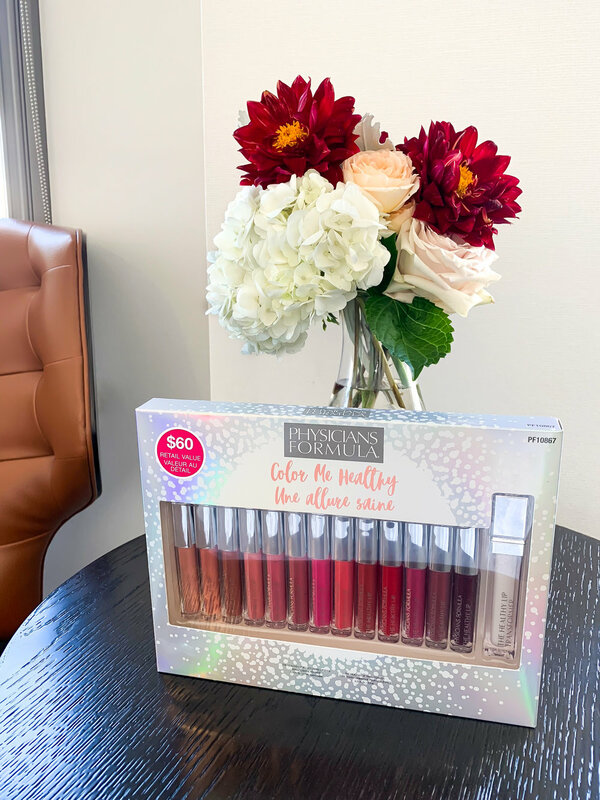 Not only does this kit come with a colorful array of beautiful long-lasting liquid lipsticks, but it also comes with The Healthy Lip Transformer - aka the final step towards shifting your lips from a semi-matte state to an opalescent shade. This lip transformer will literally transform your life for the better. If hydrating and long-lasting lip products sound like a winner to you, you already know that the Color Me Healthy kit is the ultimate Christmas gift option for yourself or that special galpal in your life. Have you tried Physicians Formula products before? Which kit would you buy for yourself or a loved one for Christmas? Share your thoughts with me in the comments section below - I would love to know more! Until next time, I’ll talk to you guys soon!